Provide comfort for the family of Melbert Seaford with a meaningful gesture of sympathy. 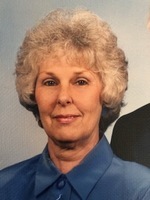 Mrs. Melbert Queen Seaford, of Dogwood Park, passed away Thursday, March 21, 2019 at her home. A memorial service will be 3 PM Monday a First Baptist Church officiated by Dr. Jim Collier. The family will receive visitors following the service in the sanctuary. Melbert was born in Salisbury to the late Earl Andrew Queen and Zora Crawford Queen. She retired from the Cabarrus County School System as a secretary/treasurer. Melbert was a giver, whether to her family, her First Baptist Church, or anyone else in need. Melbert is survived by her husband Marvin “Chick” Seaford; daughters Paris Lynch and husband Tim of Concord, and Starr Hummel and husband Scott of Hattiesburg, MS; son Todd Seaford and wife Diane of Concord; grandchildren Aaron, Seth, and Samuel Lynch, Audrey Pinion and husband Chris, Meg Simpson and husband Michael, Lauren, Rachel, and Julia Hummel; great grandchild Lincoln Pinion; sisters Janelle Young of Charlotte, Earlene Tarlton of Spartanburg, SC, and Valinda Fitzhue of Des Moines, IA; and a number of nieces and nephews. Memorials may be made to First Baptist Church, 200 Branchview Dr. SE, Concord, NC 28025. To send flowers in memory of Melbert Jo Seaford (Queen), please visit our Heartfelt Sympathies Store. The family will receive visitors following the service in the sanctuary. We encourage you to share your most beloved memories of Melbert here, so that the family and other loved ones can always see it. You can upload cherished photographs, or share your favorite stories, and can even comment on those shared by others. Circle of Friends Sunday School, Mt View Baptist S sent flowers to the family of Melbert Jo Seaford (Queen). Our thoughts and prayers are with your family, GOD's continued strength in the coming days. GOD Bless and keep you. So sorry for your loss. With our sympathy and prayers. Circle of Friends Sunday School, Mt View Baptist S purchased the The FTD Loving Light Dishgarden for the family of Melbert Seaford.